I enjoy scenes such as these. 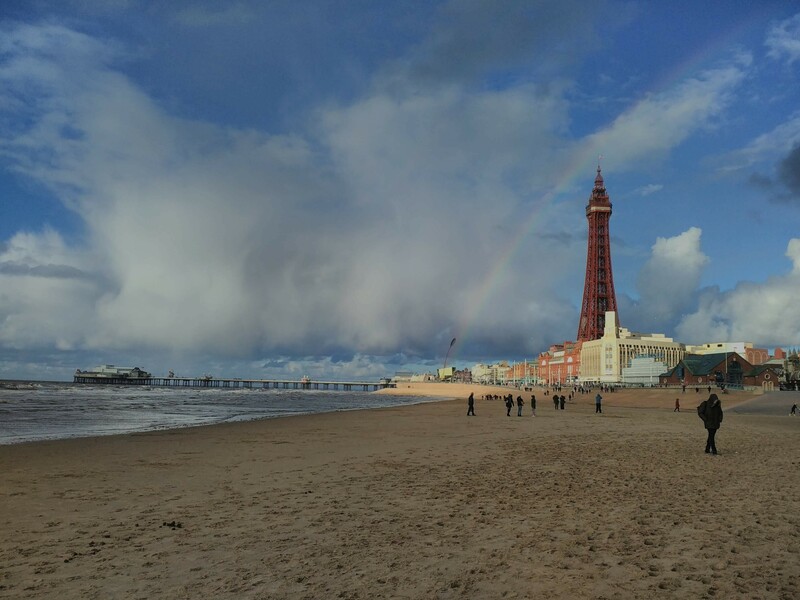 Plenty going on in a meteorological sense in this shot I took in Blackpool. A North Westerly air flow across the Irish Sea produced plenty of photogenic clouds and scenes that any weather watcher would appreciate. The Worcester cell looks a direct hit for you though. Birmingham is going to get absolutely nailed in the next 30 mins/hour. As cells continue to develop to east of main cell. Afternoon everyone. Well its been a classic morning here in North Wales so far... Dull, grey, cool, but around midday the sun finally burnt through the grey crud and it’s started to heat up quite nicely. But sadly about half an hour ago the grey crud returned... This is gonna be a 50/50 one for me I think. But the good news is that things appear to be starting to kick off around the Kettering area. As always good luck to everyone with this today. Thanks for the heads up on the new thread @Supacell i am keeping my eye on that one S of Peterborough,has some sferics on it sferics on the Worcester cell now too looking good today for the forementioned warning area's. No detections on netweather radar or mine own at the moment. Temps going up here which is needed for anything to happen. Nice hole in the showers which is line with us and the wind direction. I am on a hill with views to south, east and west. So far just haze with some sunshine poking through. Showers building quite rapidly south of the Midlands. My eyes are on the ones near to Bedford. I work outside most of the time mate. Bit of rain and wind never done anyone any harm. Folk need to man up on here. Light shower passed through may catch another slight one in a bit but can't see anything for here. Need some rain for the ponds. Yeah hopefully. 21c to 28c or above with endless sunny spells until September suits me fine I can’t understand why people want us to return to those dull depressing summers of the late 2000s early 2010s. Between Colchester and Oxford things will start initiating rapidly, just need the extra hour of daytime heating and the cap to erode a little more and then it's game on for many in the Midlands and North/West. I actually like long periods of blue skies and dry weather. This unsettled period is a nuisance for someone like myself who works outside from time to time. I think 2020 will see a shift back to cooler wetter and cloudier summers for a time, maybe until the mid 2020s. I see a return to something similar between 2007-12 happening. This drier warmer phase that’s set in since 2013 will come to an end soon. That said, 2015-17 had cooler wet spells, but the length of drier spells seem more long lasting and evident since 2013. Yes! Most potent shower of the day so far, shows the conditions are there and being utilized.